Who was the most inspiring man of the 20th Century? Churchill? FDR? Few have ever heard of my nominee: Dietrich Bonhoeffer. However, this Christmas give this book to someone you would like to inspire: Bonhoeffer: Pastor, Martyr, Prophet, Spy, a best seller by Eric Metaxas. At age 14, Dietrich told his family that he wanted to be a theologian – in a home where his parents did not attend church. His father was a noted psychiatrist. In 1927 he earned a doctorate at age 21, and the next year was a pastor in Barcelona. He said real leadership derives its authority from God, the source of all goodness. But the Fuhrer was submitted to nothing, was “self-derived and autocratic….The good leader serves others and leads others to maturity... Leaders which set themselves up as god mock God…and must perish.” Before he could finish, the prophetic speech was cut off - perhaps by Nazis. He had the courage of Jeremiah the prophet. In 1933 Bonhoeffer declared the duty of the church was to stand up for the Jews, who were prohibited from serving as lawyers, doctors, dentists, and were banned from the worlds of film, theater, literature and journalism. Bonfires were set to burn Jewish books. Bonhoeffer quoted Galatians 3:28 declaring that “there is neither Jew nor Greek, bond nor free…” He had two Jewish brothers-in-law. In response Bonhoeffer midwived the birth of the “Confessing Church,” in May, 1934 with a detailed Confession which repudiated anti-Semitism and the “false doctrine” that the Church is “an organ of the state.” Hundreds of churches signed on. Bonhoeffer paid for his fearlessness. He was told he could no longer preach, though he led a Confessing Church seminary. Soon he was removed altogether. However, the state subsidized pastor salaries, and many feared speaking out. With good reason. In 1937 800+ Confessing Church pastors and lay leaders were imprisoned. He became involved in a plot to kill Hitler with a brother-in-law and brother plus generals. Bonhoeffer said of Hitler, “Evil had stepped to the center of the world stage and removed its mask.” Bonhoeffer sought British assistance if the conspiracy could oust Hitler. Oddly, Churchill wasn’t interested. Nevertheless, Hitler boarded a plane on which a bomb was set – but did not explode. In 1944, a general carried a bomb to a meeting with Hitler that did detonate, but a long leg of a table shielded Hitler. Bonhoeffer spent two years in prison on a minor charge. But when Hitler learned of his leadership in the assassination attempt, he was hanged at age 39 – only three weeks before the war ended. 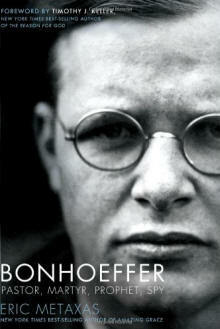 Read and give Bonhoeffer: Pastor, Martyr, Prophet, Spy to learn of a man who lived with the courage of Christ.